Setting up an OpenVPN server on a Windows Server 2008 hosted on AWS. Also tested on Windows Server 2012 R2. Download the package from the official website here (OpenVPN 2.3.2) and install OpenVPN server on a Windows machine. 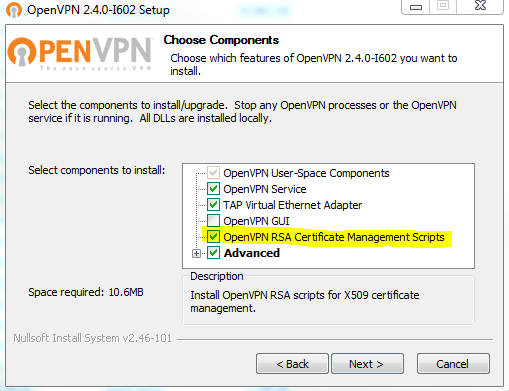 Make sure that you install the OpenSSL utilities and OpenVPN RSA certificate management scripts. [UPDATE: July 2014] Note that easy-rsa was included with 2.3.2, but is no longer bundled with OpenVPN source code archives (according to the OpenVPN downloads page). To get it, visit the easy-rsa page on GitHub. We have Windows Firewall disabled. We are going to need to open a UDP port 11194 in the AWS security group associated with the server. Find which network interface that is not connected to the Internet and has the device name listed as “TAP-Windows Adapter V9”. Rename the TAP adapter to “tap-vpn” for the sake of clarification. Generating client certificates is very similar to the previous step. Make sure that the Common Name value matches the server’s value and the Name value is specified. We can leave all other settings default. We don’t need to make any other changes. Once running in the command prompt window, OpenVPN can be stopped by the F4 key. Service also can be controlled from Start Menu -> Administrative Tools -> Services. Download the installation package here and install the OpenVPN client software. We need to copy the template file C:\Program Files\OpenVPN\sample-config\client.ovpn from the server to our client PC’s folder C:\Program Files\OpenVPN. Also copy ca.crt, client.crt and client.key from C:\Program Files\OpenVPN\easy-rsa\keys to our client PC’s folder C:\Program Files\OpenVPN\config. Launch the OpenVNP client, click “Connection Profiles” -> “Local File”, find client.ovpn, save the file. Click connect. All done. We should now be able to RDP to the server by using its private IP 10.26.0.X. This entry was posted in OpenVPN, Windows and tagged Windows. Bookmark the permalink. If you notice any errors, please contact us. Is firewall configured to allow VPN traffic? Did you enable IP Forwarding on your server? Those are a lot of errors. Can this guide be replaced by an up to date explanation for OpenVPN version 2.3.8? The current guide is not working anymore. Any help would be appreciated. This article was written year and a half ago, it is expected that things get outdated as the time passes by. What version of Windows are you using? What version of OpenSSL? What version of OpenVPN? Which command in particular gives the error? …and the contents of server.ovpn of the 2.3.8 version are much different than described on this page. I don’t know where to put those information on which lines, because of the different version this page is speaking about. Have you checked the official documentation? There are quite a few Windows notes published that you may find useful. I didn’t use OpenVPN 2.3.8 myself and therefore cannot really help much at this time. Thanks for the post, I used this instruction – http://sysadm.pp.ua/linux/shifrovanie/openvpn-client-server.html . Can anybody suggest some usefull mobile OpenVPN client? OpenVPN client is available for Android, have you tried it? I use it on a daily basis. I got a message: “VERIFY ERROR: depth=1, error=self signed certificate in certificate …”. What do I have to do to fix this? It looks like a problem with your CA certificates. Make sure you have them on the client machine. * Have you opened 11194 UDP port in your router to your local Ethernet private IP? * Have you configure anything in TAP nic? * Have you configure static routes somewhere? Im trying to set up at home and i cant “RDP-ing” my PC (OVPN server is on it – Ethernet nic and TAP nic) so i connect client to server but can not RDP my PC. I wrote a message a few hours ago and now is not here, what happens? All messages get manually approved before they appear on the comments board. I’ve tried and make it exactly like Tomas on the local network, and it works well. For openvpn server must be connected first in the OpenVPN GUI in order to tap adapter can accept connections from the outside, then the client can connect to the server. – For the client I use windows 7 64-bit and Installer (64-bit), Windows Vista and later swupdate.openvpn.org/community/releases/openvpn-install-2.3.11-I601-x86_64.exe. Currently I am just trying to the local network, not using the internet network. Supposedly by setting like this, it can be done for vpn over the internet, as long as the modem router has been made for the forward port 1194 to a computer that is in use as a server. On github, the search for the good files modified, v 3.0.1 or v 3.0.2 are difficult. May be, you have the good information and procedures to create on Windows the differents certificates. It so happened that a few day ago I had to deploy an OpenVPN server on Windows 2012 R2. I installed OpenVPN 2.4.0 by following this very blog post, and had no issues at all.